For making large things look small, see Miniature faking. 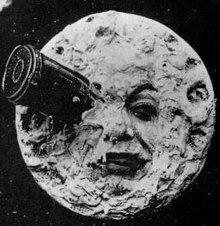 Early model use from "A Trip to the Moon"
French director Georges Méliès incorporated special effects in his 1902 film Le Voyage dans la Lune (A Trip to the Moon) — including double-exposure, split screens, miniatures and stop-action. Some of the most influential visual effects films of these early years such as Metropolis (1927), Citizen Kane (1941), Godzilla (1954) The Ten Commandments (1956). The 1933 film King Kong made extensive use of miniature effects including scale models and stop-motion animation of miniature elements. The use of miniatures in 2001: A Space Odyssey was a major development. In production for three years, the film was a significant advancement in creating convincing models. In the early 1970s, miniatures were often used to depict disasters in such films as The Poseidon Adventure (1972), Earthquake (1974) and The Towering Inferno (1975). The resurgence of the science fiction genre in film in the late 1970s saw miniature fabrication rise to new heights in such films as Close Encounters of the Third Kind, (1977), Star Wars (also 1977), Alien (1979), Star Trek: The Motion Picture (1979) and Blade Runner (1982). Iconic film sequences such as the tanker truck explosion from The Terminator (1984) and the bridge destruction in True Lies (1994) were achieved through the use of large-scale miniatures. The release of Jurassic Park (1993) was a turning point in the use of computers to create effects for which physical miniatures would have previously been employed. While the use of computer generated imagery (CGI) has largely overtaken their use since then, they are still often employed, especially for projects requiring physical interaction with fire, explosions or water. Independence Day (1996), Titanic (1997), Godzilla (1998), The Star Wars prequel trilogy (1999-2005), The Lord of the Rings trilogy (2001-3), Casino Royale (2006), The Dark Knight (2008), Inception (2010), and Interstellar (2014) are examples of highly successful films that have utilized miniatures for a significant component of their visual effects work. "Slurpasaur" is a nickname given to optically enlarged reptiles (and occasionally other animals) that are presented as dinosaurs in motion pictures. Concurrently with Willis O'Brien and others in making stop-motion animated dinosaurs since the early days of cinema, producers have used optically enlarged lizards, often with horns and fins glued on, to represent dinosaurs, to cut costs, and to present a living analog to dinosaurs, despite huge morphological differences between dinosaurs and reptiles. The first film that used reptiles dressed as dinosaurs was D.W. Griffith's Brute Force. Various slurpasaurs appeared in the 1929 film version of The Mysterious Island, the 1933 British film Secret of the Loch, and the 1936 Flash Gordon serial. The first major use of the slurpasaur was in One Million B.C. (1940), which included a pig dressed as a triceratops, with the special effects in this film re-used often, such as in the 1955 movie King Dinosaur. Other notable films with slurpasaurs include Journey to the Center of the Earth (1959) and The Lost World (1960). The former featured reptiles with attached tall spinal fans, simulating Dimetrodons and looked superficially similar to those creatures, as Dimetrodons had a low slung body structure more reminiscent of lizards. The latter is notable for a dinosaur battle wherein a monitor lizard and a young alligator engage in an unsimulated, fierce battle. On the 1960 Lost World, O'Brien, who did the stop-motion dinosaurs for the original, was hired as the effects technician, but was disappointed that producer Irwin Allen opted for live animals. Lorne Peterson Star Wars Episodes 1 - 6, Raiders of the Lost Ark, Battlestar Galactica. Grant McCune: Star Wars, Battlestar Galactica, Star Trek: The Motion Picture. Matthew Gratzner: The Aviator, The Good Shepherd, Pitch Black, Alien Resurrection. ^ Chmielewski, Dawn (May 21, 2006). "A medium in motion". Los Angeles Times. ^ "Miniatures In a Digital World". Digitalcontentproducer.com. Retrieved 2013-02-03. ^ "The Incredible Invisible Star Wars Prequels Miniatures". 2 June 2014. ^ "PT - Practical Effects in the Prequels- Sets, Pictures, Models, etc". ^ "Miniature Dark Knight Physics, 50 Coraline Boxes, & The Digital Pitts..." Vfxplanet.vox.com. Archived from the original on 2010-02-06. Retrieved 2013-02-03. ^ "See the Incredible Interstellar Miniature Models - /Film". 12 December 2014. ^ "Biography | Steve Gawley". Star Wars. Archived from the original on 2008-06-20. Retrieved 2013-02-03. ^ "Biography | Lorne Peterson". Star Wars. Archived from the original on 2008-06-05. Retrieved 2013-02-03. This page was last edited on 14 March 2019, at 18:24 (UTC).